I miss these little guys! 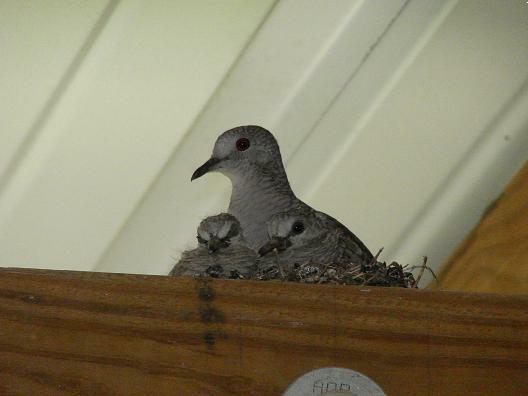 Way back in the spring, we had a mama dove build a nest up on the header beam of our patio and it’s been used three different times to raise little birdy families. I’ve been such an absolute nut about it…..these are just two of the countless photos I’ve taken of them. The mama (or I guess it could be the daddy) sits in the nest for about three weeks solid. I don’t really know how long it takes for the eggs to hatch but I know it’s almost a month before we get to see the babies. Once we see them though, it’s about a week or so and then they are gone. Aren’t they cute? I would climb up on the counter and snap pictures through my kitchen window so I wouldn’t disturb them. The family before this one I actually got to see the babies after they left the nest. I wish I had gotten to see them actually fly away for the first time but I didn’t. When I did see them, they were hanging around on the swingset. I was amazed at how big they were! I was determined to see these little guys make their first flight but that didn’t happen either. 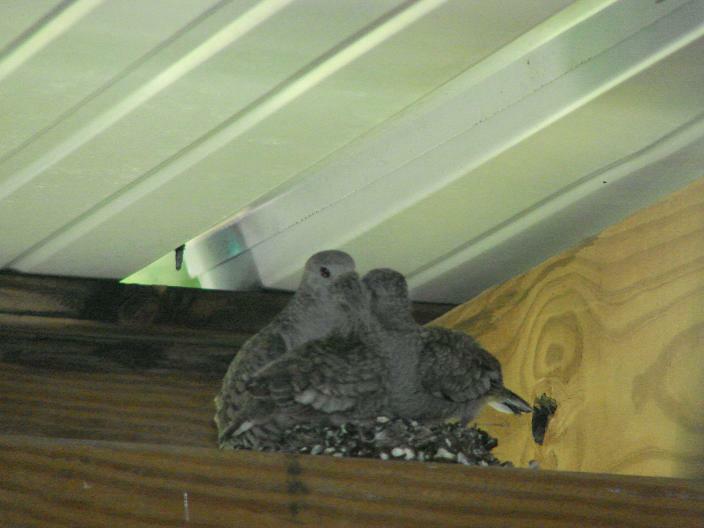 I had been out running errands and when I got home and checked on them, the nest was empty. I was so disappointed!! About a week before these little guys flew away, I noticed this ritual they did with their Mom every day. All three of them would put their beaks together and sway in a circle. It was the oddest thing I’ve ever seen! They did this several times a day. And yes, I spent lots and lots of time just watching these guys which I know makes me sound pathetic but I couldn’t help myself. My family was beginning to get a little worried I think. I wonder if all mama birds do this with their babies or if it was just this one and if it has any meaning?